On the Spotify platform, followers and monthly listeners are of course important KPIs to track on your favorite artists. 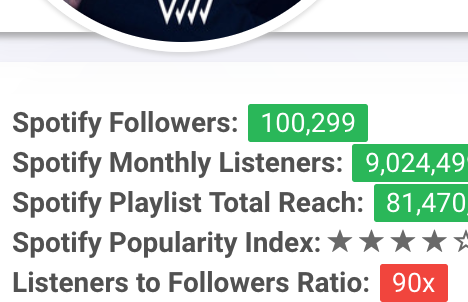 However, we also list the ratio of one artist's Spotify Monthly Listeners divided by their Spotify followers, as we believe it shows an important relationship between an artist's spins (more active, recent interest) and popularity (more passive, one-time interest). Spins are spins, whether off of a playlist/library/search query, and your artist is getting heard. While followers are certainly another important KPI, one user follow is a singular event in time that could very well be forgotten about and not followed up on, even if Spotify uses that data to raise that artist in your algorithms. Higher ratios seem to indicate real value though somewhat under the popularity radar, but an artist's situation should always be considered during analysis. If used as a comparison tool (this is available as a sortable value in your Dashboard), keep an artist's career stage in mind...a lot of baby artists have ratios less than 1 due to little play but a handful of follows, and world-wide stars many times only sit between 1-10, because they're so overexposed on both sides of the equation. However, many emerging artists have ratios 10+, some way past. That's why we think this is such a powerful ratio for discovery.